Father! At last I can exclaim, Hurrah! Hurrah! I have closed Power From On High! Closed? Ended? Finished it? Well, well, well! Is there an end to the many ways that one can express a matter? Hardly! In fact, yours truly is crazy enough to take advantage of as many ways to express myself as ways there are! Crazy? Indeed! But that is what makes my writing style if nothing else a unique style! Effective? That’s the big question! Is there an answer for my big question? It seems to me that the many awesome I get from other bloggers answer my big question: Yes! My unique writing style is effective! Ha! Ha! HalleluYah! What am I Ha! Ha! HalleluYing about? Well, Ha! Ha! Expresses my joy and HalleluYah means praise to Yah—short for Yahuwah the Almighty Creator of our beings and the One that originates all good things that I do! My Father, as You know I have not posted anything in the blogs since the last post, why? Because I have been compiling the title Power From On High that You instructed me to compile. 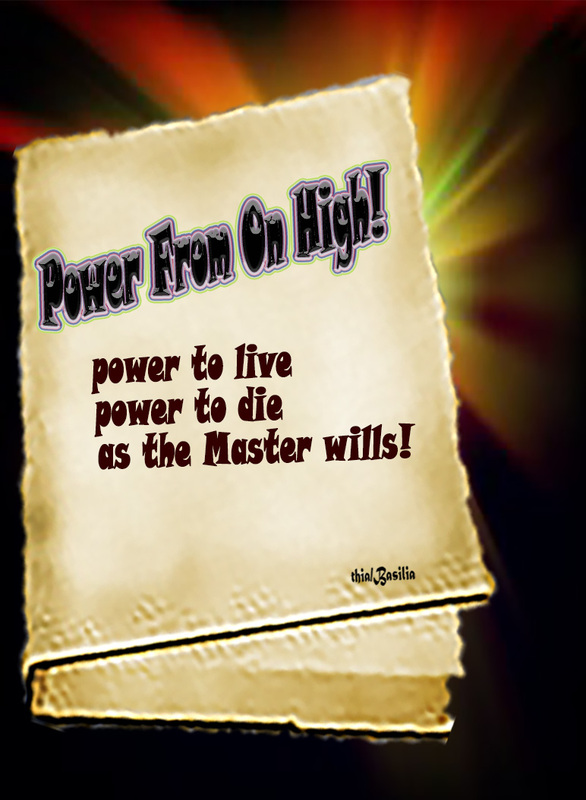 Power From On High is now here to vibrate in the waves of the Internet post by post, chapter by chapter to impact the Power From On High to all willing to live an overcoming life above the adversities of our present existence! Now, in the reality of books to catch & hold the interest of the reader perhaps this book does not measure up because at first sight there is nothing spectacular about the details of my daily existence. In fact the day to day struggle with my carnal self goes on & on—now I am up in the mountain of hope next thing I am down in the valley of despair and repeat! In addition, this book is not for study for it is not a book containing anything new to be studied. And He replied to him, You shall love the Master your God with all your heart and with all your soul and with all your mind (intellect). This is the great (most important, principal) and first commandment. LOVE means OBEDIENCE! To love God—our Father/Creator means obedience to His commandments! The love for our families & ourselves comes secondarily not as the main purpose in our lives! Moreover, this book is the record of my long struggle to please myself and my children and my friends ahead of my Father/Creator until the Father/Creator confronted me and ended such struggle to set me as an example of His good will for all of His children! Why? Why setting me as an example of His good will for all of His children? Because, in order to love God above all things we must establish a personal relationship with God—our Father/Creator! And the building of that relationship does not come without the struggle to overcome our natural or carnal selves—by nature we are unable to love God above all things! Kid not yourself—it’s impossible! Thus the example of my struggle & the final outcome by the power from on high invested upon yours truly for the benefit of our Father/Creator’s children! Could you give me a clue as to whether this announcement has impressed you enough to continue your reading in the next post? I covet your comment!